It is customary in Samoa to celebrate the beginning of the roof works when a house is built. 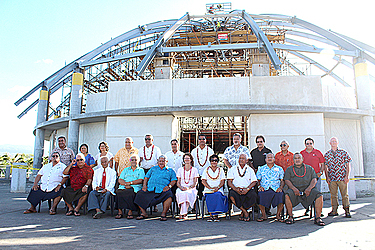 With that in mind, Members of Parliament gathered at Mulinu’u on Tuesday afternoon to celebrate the installation of the complex roof steel framing for the new Maota Fono. 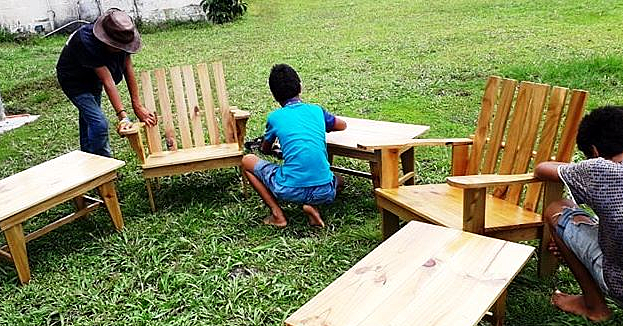 The government of Australia is funding the bulk of the project with support from the government of Samoa. Australia’s High Commissioner, Sue Langford, joined Members of Parliament. The design and construction of the new Maota Fono incorporates traditional Samoan architecture and modern building technology. The building has been designed by a consultant team led by Manteena Australia and is being constructed by Craig Construction Limited. 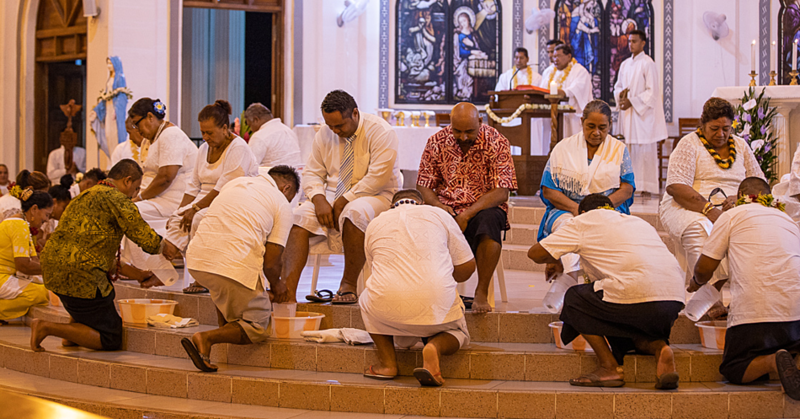 The ceremony was led in prayer by Reverend Iamafana Faauuga. A bouquet of flowers was taken to the highest peak of the ceiling as part of the celebration. 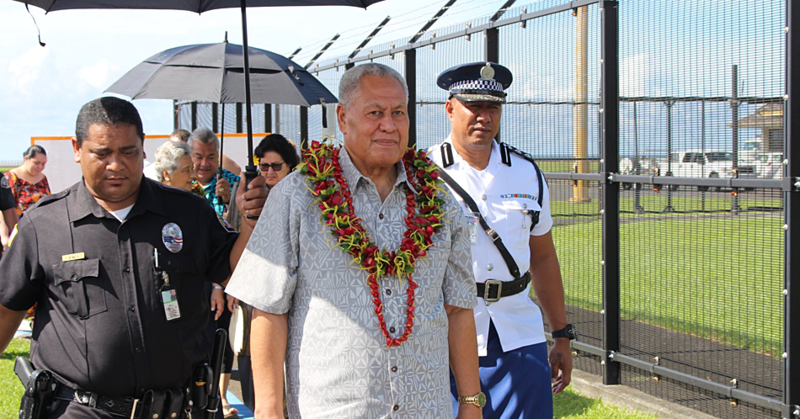 Prime Minister Tuilaepa Dr. Sa’ilele Malielegaoi commended all those involved in the project. “We extend our very special thank you to Australia, High Commissioner, Sue Langford who provided the bulk of the funding for the new Parliamentary building,” he said. “We have reached that stage of the building that once the roof goes up its Samoan custom to celebrate the occasion." “It is the moment that we contribute part of the reward for the contractor because in the olden times, all they get were the traditional presentation, a pig to keep them going, because at this stage, everyone will know we will complete the building." Craig Construction President, Francis Craig, told the Samoa Observer the Parliamentary Building is one difficult project. “When I say difficult, I am talking about the fine details of the building, from the inside floor that is 2.4 feet deeper, the heavy compactions, to the outside wall of the building. “The wall is not painted and there is no patching, all we need to do is polish up the walls and that’s it,” said Mr Craig. Established in the 1980s this is the first time Craig Construction has worked on a round building and so there are challenges. “The round building design and exterior are very decisive then we now have the ceiling to deal with, another difficult aspect of the project. “The ceiling is designed from overseas, it was actually designed by the Australian people and all we do is follow the instructions as per installing the ceiling,” he said. According to Mr. Craig, the building should be handed over to the government before May 2018. Despite the challenges, Mr. Craig said this is one for the books for him. “This building is where Samoa’s core decision pertaining to culture, traditions, constitution, judiciary, our Christianity will be discussed and to be a part of this project is a milestone for me, and our employees,” he told the Samoa Observer. Project Manager, Daniel Nazdin, of Manteena says the building meets the Samoan Building Code and relevant Australian and New Zealand Construction Standards. It takes into account climate resilience and occupational health and safety guidelines. At the time Australia’s High Commissioner, Sue Langford, said she was pleased with the progress so far, which was discussed at bilateral talks between Australia and Samoa recently.